A once-restive nation finds itself deep into one of the bloodiest periods it has seen in its recent history, even as the economy grows at a rate that defies international expectations, leading many to argue that the growing-level of wealth disparity in the Dominican Republic has exacerbated violent crime. The Dominican National Police, which has been described as a largely-unchanged institution since the fall of the Rafael Trujillo dictatorship, operates at feudal/militaristic level, with underpaid privates often being incarcerated for breaking department regulations. This bizarre system of incarcerating officers who fail to shave or trim their hair to department standards along with hardened criminals has led to the infiltration of criminals into the police force, with some Dominican prosecutors complaining that a large number of violent and drugs crimes in the country are committed by police officers. Not surprisingly, many of these same police officers are trigger-happy, often gunning down suspects and wanted individuals before asking questions, while claiming that "they died in a shootout." The first person gunned down by the Dominican police this past weekend was José Luis Espinal Rosario, who was accompanied by his wife at the time of the shooting. Mr. Espinal was shot multiple times, and the police thus far refuse to reveal exactly how many bullets impacted his body. Mr. Espinal was wanted for multiple crimes and had not turned himself in, something which many Dominican police officers take as a license to kill. On Sunday, more blood was spilled on Dominican streets when two individuals allegedly belonging to a deadly gang tied to 15 robberies were surprised exactly while they assaulted a truck carrying a large sum of money. 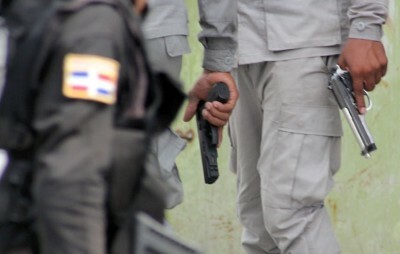 Police provided no evidence that the two individuals were intercepted during the commission of a crime, or that they tried to evade the law, but considering that many Dominican police officers walk around with a gun in the hand, the slightest movement could mean a gruesome death. As the people demand a more firm response to the wave of increasingly-violent crime, police are further instructed to kill wanted suspects on sight, with the rule of law become the rule of the gun.